Hearing is a complicated process. In a normal ear, sound vibrations are funnelled by the outer ear into the ear canal where they hit the eardrum. 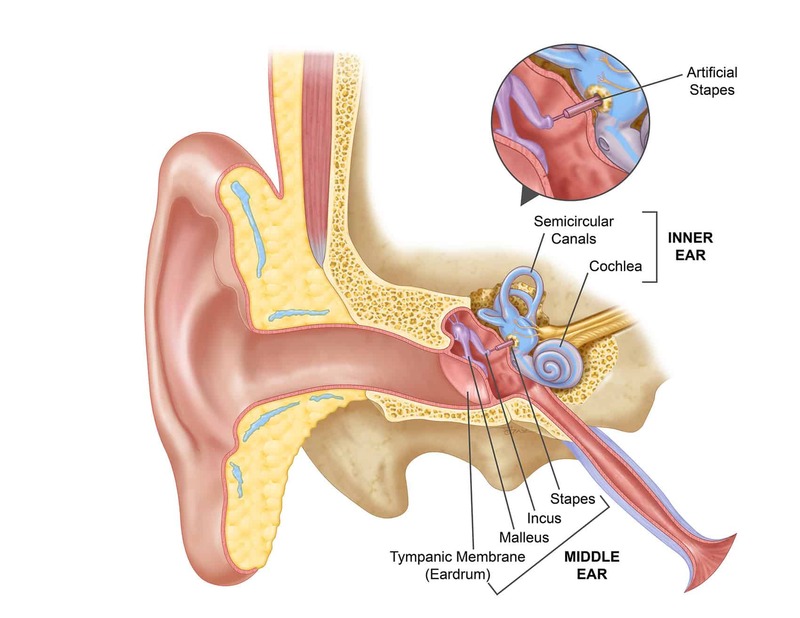 These vibrations cause movement of the eardrum that transfers to the three small bones of the middle ear, the malleus (hammer), incus (anvil), and stapes (stirrup). When the stapes bone moves, it sets the inner ear fluids in motion which stimulates the auditory (hearing) nerve. The hearing nerve carries sound energy to the brain. Hearing becomes impaired if any part of this process is compromised. If the bone grows into the inner ear, causing inner ear deafness, surgery is not an option. This condition is called cochlear otosclerosis. Occasionally, patients can have a combination of cochlear and stapedial otosclerosis. An estimated 10 per cent of the adult Caucasian population are affected by otosclerosis. The condition is less common in people of Japanese and South American descent and is rare in African Americans. Caucasian women who are middle aged are most at risk. The most typical symptom is gradual hearing loss. It can begin anytime between the ages of 15 and 45, but it usually starts in the early 20s. Both women and men are at risk, but the disease is particularly troublesome for pregnant women who, for unknown reasons, often experience a rapid decrease in hearing ability. About 60 per cent of otosclerosis cases are genetic. On average, a person who has one parent with otosclerosis has a 25 per cent chance of developing the disorder. If both parents have otosclerosis, the risk goes up to 50 per cent. Gradual hearing loss is the most typical symptom. Often, individuals with otosclerosis will first notice that they cannot hear low-pitched sounds or whispers. Other symptoms can include dizziness, balance problems, or tinnitus (ringing in the ears). Because many of the symptoms can also be caused by other medical conditions, it is important to be examined by an otolaryngologist (ear, nose and throat specialist) to eliminate other possible causes. After an ear examination, the otolaryngologist may order a hearing test. Based on the results and the exam findings, the otolaryngologist will suggest treatment options. If the hearing loss is mild, the otolaryngologist may suggest continued observation and a hearing aid to amplify sound reaching the eardrum. In most cases, a surgical procedure called stapedectomy is the most effective method of restoring or improving hearing. A stapedectomy is an outpatient surgical procedure done under local or general anaesthesia through the ear canal with a microscope. It involves removing the fixed stapes bone and replacing it with a prosthetic device. The device allows the bones of the middle ear to move again, stimulating fluid in the inner ear and improving or restoring hearing. Surgery normally takes around one hour. Modern-day stapedectomies have a success rate of 90 per cent. Providing the cochlea function is good, hearing can be restored. Common risks include dizziness and taste disturbance or mouth dryness. However, in rare cases (about one per cent of surgeries), the procedure can make hearing worse. Patients can also encounter rare cases of fistula formation, cholesteatoma (cyst), tinnitus, susceptibility to noise trauma and more serious conditions. It is recommended patients consult their surgeon about the full risks involved. Otosclerosis affects both ears in eight out of ten patients. For these patients, ears are operated on one at a time with the most affected ear being operated on first. The second ear can be operated on after 9-12 months. Most patients return home the evening after surgery to lie on the un-operated ear. Oral antibiotics may be prescribed by the otolaryngologist. Some patients experience dizziness in the first few days after surgery. Taste sensation may also be altered for several weeks or months following surgery, but it usually returns to normal. Patients may be asked to refrain from blowing their nose, swimming, or other activities that may get water in the operated ear. Normal activities can usually resume two weeks after surgery. Air travel is possible after six weeks. Any new symptom relating to the operated ear. Since packing is placed in the ear at the time of surgery, hearing improvement will not be noticed until it is removed, usually a week later. The eardrum will heal quickly, generally reaching the maximum level of improvement within two weeks. Professor Atlas has published his results following stapedectomy surgery in the international medical literature, which is peer reviewed and compared to major institutions worldwide. The results of the stapedectomy are equal to or better than major international institutions.